The world imagined by Chinese writer Jin Yong is one which celebrates loyalty, courage, and the triumph of the individual over a corrupt and authoritarian state—carried out by no less than heroes who fly through trees and deliver deadly blows to their enemies with a single finger. It’s a world familiar to many readers of wuxia (martial-arts related fiction) writer Jin Yong, a pen name for Louis Cha, the best-selling author in the Chinese-speaking world. Though Cha’s fantasy worlds rival J.R.R. Tolkien’s every bit in creativity, breadth, and depth, his works remain relatively unknown to English readers because of a conspicuous lack of translations. Now his Condor Trilogy (1957), arguably the most celebrated of the 93-year-old writer’s works, is finally getting translated into English. Like Tolkien, the themes of justice and heroism are also central to Cha’s works. But unlike the British writer’s fantasies about hobbits, elves, and orcs, Cha’s world is in fact rooted in China’s past, a sort of historical fiction that reimagines alternative “what if” scenarios in history. Legends of the Condor Heroes, the first book of the Condor trilogy, is set in 1205 in the Southern Song Dynasty of China, at a time when the Han Chinese population faced continuous attacks from the northern Jurchen Jin dynasty, as well as from Genghis Khan’s Mongols. The story centers around two heroes, Guo Jing and Yang Kang, the sons of two close friends who bonded over their fierce resistance against the Jurchen invaders, and who want their boys to be sworn brothers. Guo is taken in as a child by Genghis Khan’s army, but eventually comes to fight against the Mongols. “Most of his novels are Bildungsroman, in which a young hero experiences numerous ordeals and romance, and gradually grows to be a perfect hero who not only has the ability of fighting evil and saving the world, but also embodies parts of Chinese culture, such as Confucianism, Daoism, and Buddhism,” said Liu Jianmei, co-author of The Jin Yong Phenomenon and a professor at the Hong Kong University of Science and Technology. 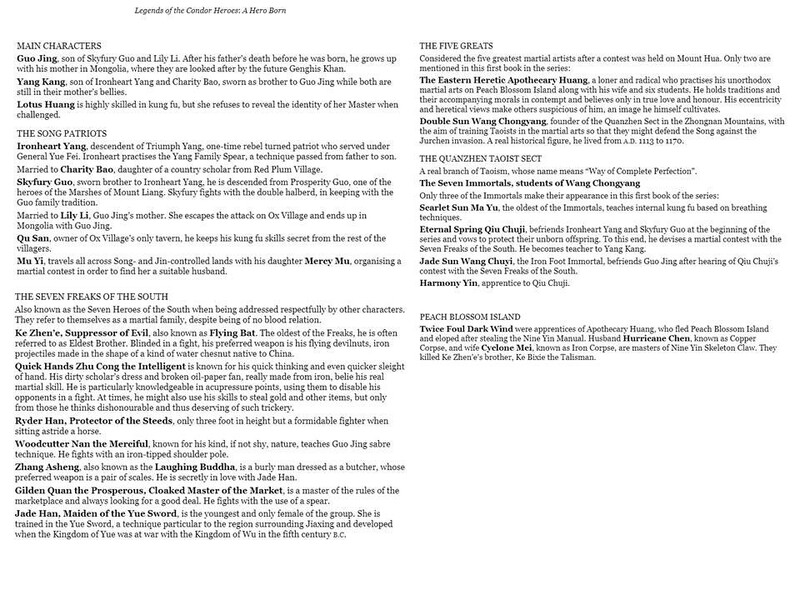 The characters in Cha’s world—who have colorful names like the “Seven Freaks of the South” and “Immortal Cloud Sect”—operate in what is known as the jianghu, a term that is familiar to Chinese speakers and any reader of wuxia fiction but difficult to translate into English. The word literally translates as “rivers and lakes,” but is typically used to mean people who live in a world parallel to conventional society, one that operates by its own laws and code of ethics. It is closely linked to another wuxia term, the wulin, or “martial arts forest,” referring to a community of people practicing martial arts. Characters in a TV adaptation of Legends of the Condor Heroes by Cantonese broadcaster TVB in 1994.Screengrab/TVBA still from an adaptation of “Legends of the Condor Heroes” by Hong Kong broadcaster TVB in 1994. Indeed, one of the reasons that Cha’s novels have for so long lacked English translations despite his popularity in the Chinese-speaking world is that it was simply deemed too difficult. “Translating Jin Yong is often a daunting task because of the complexity of his language, which integrates prose and poetry and makes extensive use of ‘four-character phrases’ and other Chinese idioms in order to recreate the ‘feel’ of traditional Chinese vernacular novels,” said Petrus Liu, associate professor of Chinese and comparative literature at Boston University. The first volume of the first book of the Condor trilogy, A Hero Born, is translated by Anna Holmwood. All in all, the trilogy will be translated into 12 books in English. Sweden-based Holmwood worked in collaboration with a UK agent to find a publisher for Condors in 2012, pitched as a Chinese answer to Lord of the Rings. The book was picked up by London-based publisher MacLehose Press, and is scheduled for a February 2018 release. Translating A Hero Born alone took a year and a half, Holmwood said; another translator has been brought on to continue with the next volume. Holmwood said that many Chinese fans of Jin Yong have been “quite obsessed” with how she would translate the myriad names of martial arts moves in the novels in particular. Some of the translations used by Holmwood include “Branch Beats the White Chimpanzee,” “Nine Yin Skeleton Claw,” and “Lazy Donkey Roll”—a move whose true strength is belied by its apparent softness, she explained. Though Cha’s novels, characters, and martial arts moves are now recognized across the Chinese world, for many years his 15 martial arts novels were off limits to the vast majority of Chinese speakers. Cha moved to Hong Kong from Shanghai in 1949, the same year the Chinese Civil War ended and the communist-ruled People’s Republic of China was founded. He continues to reside in Hong Kong today. In Hong Kong, Cha founded Chinese-language newspaper Ming Pao, which was seen as an anti-Communist publication back then—today Ming Pao is still viewed as one of the most well-regarded newspapers in Hong Kong. Cha serialized his novels in the newspaper. He was also a vocal critic of the Cultural Revolution launched by Mao Zedong in 1966, and as a result his literature was banned in China. His works were also banned until 1979 in Taiwan, because the then-ruling military government felt it saw communist influences (links in Chinese) in some of Jin Yong’s works. The turning point came with the accession of the reformist Deng Xiaoping to power in China. In 1981, Deng, who was reportedly a fan of Cha’s novels, invited him and his family (link in Chinese) to Beijing’s Great Hall of the People for a meeting, and Cha’s novels were allowed in mainland China (paywall) in 1984. Cha’s popularity in China was also boosted by a series of television adaptations of his books by Hong Kong’s main Cantonese-language broadcaster TVB in the 1980s. Today, evidence of Cha’s influence can be found in China in the most unlikely of places. For example, Chinese e-commerce pioneer and Alibaba founder Jack Ma is a huge fan of Cha, and martial arts more generally. Ma adopted the nickname Feng Qingyang, a swordsman from one of Cha’s books, The Smiling, Proud Wanderer (1967). Alibaba’s values are also dubbed “Six Vein Spirit Sword,” a reference to Demi-Gods and Semi-Devils (1963). Employees at Alibaba have nicknames based on Cha’s novels, or other martial-arts characters. Cha hasn’t written a novel since the 1970s, and rarely makes public appearances anymore due to frail health. But the lessons of Cha’s novels are still as relevant as ever. do we know the credentials of the translator? i can see that the translations of the martial arts moves is going to be trickiest... and sound long and cumbersome in english. but kudos to anyone making the attempt to bring the books to an english-speaking audience! No idea about the credibility of the translator. but the translator translated some of characters names into English. I have some wuxia translation novels in English, and some of them, I couldn't bear to read it because of the translated name. o.O i'd like to know the reasoning behind mei chaofeng's translated name. that's not what it means in chinese, as far as i can recall the chinese characters without looking it up for verification. with huang rong, fine, that's technically what her name means. names are always hard--do you go with meaning, do you find an english equivalent, or do you just do transliteration? the name will be awkward and weird, whatever form it takes, because it's not a true english name. For names, I guess it's never a good idea to translate. Even for so called western or Christian names, mostly they're from Hebrew or other languages. Just imagine if "Moses" is translated into English Bible as 'pulled from the water" or Gabriel as "the strength of God" or Ariel as "the lion of God" doesn't make any sense at all! Exactly! Names should be left as is, in pinyin form. A footnote to explain if need be but don't translate the names. Even names like Sweeper Monk should be left as is IMO. Has anyone got their hands on this? When I read about this on the news and saw the local reporters/netizens speculating on how tough it would be to translate, I was like "Oh c'mon, English speaking fans have been doing this for years, the translations and their paradigms are quite clear." And then news of some controversial translations came out. His companion looked at him meaningfully, but Guo Jing did not know what a lotus was and thus could not understand the significance of the revelation. Not to undermine the translator's effort, I guess there are some things that are required to make it more English friendly. Admin yenchin @all have merged two threads with the same topic--renamed to combine the thread titles. easier to have one discussion. and yenchin, while i understand why the translator may have felt the need to translate the names rather than just transliterating them, some of the choices are WEIRD. and yeah, i don't know that i agree with ADDING lines to "explain" names. having tried my hand at translating from chinese to english (and from english to chinese at my job), i know that it's impossible to expect a word-for-word translation. and in fact, it wouldn't make sense, as sentence structure varies and certain turns of phrases just cannot be translated directly. it's why the phenomenon of chinglish is so prevalent and the cause of much amusement to truly bilingual speakers. so, as long as the interpretation is correct, and the writing style is mimicked as close as possible, then that's what a proper translation is. the mongolian and jurgen names use the spelling standards of their native languages OR the universally recognized spelling in the case of historical characters (e.g. genghis khan). i was reading through the prologue--she doesn't explain why some have translated names, some have pinyin names. it confuses ME, so never mind non-chinese readers! but a quick browse online shows that majority of non-chinese readers are enjoying the story, meaning they are overlooking the pitfalls of the translation and appreciating the story for the masterwork that it is. which is good and the whole point of the translation! so, i guess we shouldn't be too persnicky with our criticisms. while it'd be ideal to have footnotes to explain names and even certain historical and literary references, it's usually not welcome in fiction. people feel it's too much like a history book or other work of non-fiction. they want to be able to just read a story without pausing to read the extra bits at the bottom. so, i can understand why the translator avoided this. This is what happens when I'm out of sync with the forum. I thought there would be a thread but couldn't find it back in March I think, and then I was on hiatus. Trying too hard on a lot of names, resulting in two "nicknames" for each. Also it seems that the preferred weapons are incorrect (probably a fluke in editing). Flying devilnuts: Despite the exotic name, Ke's projectiles are actually a common seen weapon called "caltrop". "a pair of scales": This mentioning might be confusing I assume? Chinese market scales seem to not qualify for "a pair" as a unit. 鬧市俠隱 doesn't mean cloaked, it means he's like a hermit, retreating/hiding in the markets. I find it funny that regarding Nine Yin, the Yin is not translated, while all the "Yang" in the Taoists' names are translated to Sun (which, in a nitpicking sense, since the sun falls in the Yang category, and not the other way, it's not quite correct). Twice Foul Dark Wind: At this point I'm not sure why it is translated like this. Why "Twice" instead of something like "duo"? To be frank, I really dislike the idea that often when some special term is translated from English, sometimes it's only a localized pronunciation and no effort to show what it's about is required, for instance, hamburger -> 漢堡, but when some term is translated to English, often people take pains to explain the term in the translation..."so that the readers can understand". But I guess that's just me. I don't quite like the use of names by the translator. Mei ChaoFeng should be left in Hanyu Pinyin, or, if translated, she should be Supreme Wind/Storm (or something similar). Twice Foul Dark Wind is a translation of 黑风双煞, being 陈玄风 and 梅超风. That's the duo, not Mei ChaoFeng by herself. yenchin chefying yeah, the mixed bag of names is confusing. and misleading! as for the weapons, do you think she purposely chose not to consult published references (because i know they exist!) and use her own "interpretation"? one of the articles mentions she's married to a taiwanese. i wonder if he influenced some of her choices--like, instead of just sticking to one version of a name, he may have insisted that the nicknames be incorporated because of preference, habit, or whatever nostalgic factors ('cause i doubt that he would be unfamiliar with the trilogy, even if his knowledge stems solely from adaptations). with the quibble about keeping "yin" as is and translating all references to "yang", it almost seems as if she used a translation program, doesn't it? these programs would not pick up on such nuances. because i only found the first pages available via amazon, i don't know if she has an afterword or appendix that explains her choices in more detail. the prologue doesn't explain yin-yang either, so if she truly thinks her readers have zero knowledge of chinese, then keeping certain concepts in the pinyin would make no sense to the reader. i also hope she explains how skyfury guo and guo jing could be father and son, given that their surnames aren't in the right order. it's interesting about the differences between chinese-english and english-chinese translations. perhaps it was intentional to do transliteration of english terms to chinese to indicate that they are borrowed words/concepts? perhaps they learned from the "error" of using taoist terms to translate buddhist concepts, hence causing misunderstandings through the centuries? or maybe it was just easier to transliterate than to find an appropriate equivalent term or create a word--certainly, transliteration is way simpler for new technologies, like cars and taxis, given that most of the world was in the horse-and-buggy stage of transportation. i will say: i think it's unnecessarily complicated to have a separate word for certain english consonants because it makes long english names even longer when transliterated into chinese. the multi-syllables of english names is bad enough without the chinese being an even bigger mouthful. take the surname of the current fathead chief of the usa: single syllabled surname becomes triple-worded surname in chinese. The translator seems to have studied Chinese and lived in China for awhile, this makes it seem a bit awkward to me because at this point likely she understands the literal conventions and some other details on the language. I think her husband may have had some influence, since Chinese speakers themselves indeed often tend to translate every single word, often explanation included, to English when introducing something. On the other hand, I think "Yin-Yang" has kind of been incorporated in the English language? Years ago when I was studying in the States I remember a lecture when the professor suddenly said "These are the yin-yangs of.....", not to mention once in awhile an article using this shows up, which gives me an impression that like "Kung Pow", "Boba"...etc and some other loan words English readers at least have a rough idea of Yin-Yang. A lot of Buddhist terms are also tranliterations. 湼盤, 佛陀, 僧伽 ....etc It seems to me that if a term is unique, and there are too many concepts behind the term, one might as well just transliterate it. No one calls sushi "small rice ball with blablabla", and look what happens when people are lazy and call a dish "dumpling"
In Taiwan we only need two characters for Mr. POTUS，川普，the pronunciation is not totally precise, but it is more accurate syllable-wise.